Alloy Art is a brand built on innovation and common sense. Founder Robbie Lane is an experienced custom builder who – instead of running into an issue and saying “I wish someone would fix that” – comes up with innovative solutions. 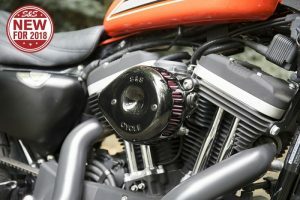 If your front fairing is vibrating or you’re worried about weighing it down with aftermarket speakers, Alloy Art has a set of brackets to fix that. If your handlebars are feeling sloppy and not responding the way they should, some of Alloy Art’s riser bushings could help. Perhaps most impressively, the guys at Alloy Art have also developed their wildly popular Super Cush Replacement Drive Dampener. Designed to replace the OEM rear pulley cush drive in ’09up Touring models, the Super Cush absorbs drive-train shock at the rear wheel. Made from a proprietary material that lasts longer and is more absorbant than the OEM equivalent, Alloy Art’s Super Cush doesn’t compress or break down the way the stock rubber ones do, so you’ll feel less jerking and rear-wheel bump on hard accelerating and throttle release. Next time you run into something that needs a smart yet simple solution, check out what’s on offer at Alloy Art.